April 8, 2019 – The Santa Fe Saints baseball team took advantage of early wildness by the Blue Wave pitchers, scoring eight runs in the top of the first inning with just three singles on their way to a 13-2 win in the rainout makeup game played in Jacksonville Sunday. The Saints (28-13, 9-7 Mid-Florida Conference) scored three runs without recording a hit. Florida State College-Jacksonville starter Collin Weghorst faced just six batters, walking three and hitting two others. Reliever Brandon Cruz promptly hit the first batter he faced and then surrendered consecutive singles to Jonathan Logsdon, Cale Jones and Parker Biederer. The Saints are presently in third place in the conference with a 9-7 record, three games behind The College of Central Florida and two games behind Seminole State College with eight games to play. SF travels to Leesburg to take on Lake-Sumter State College at 3 p.m. Monday before returning home to host LSSC at 3 p.m. Wednesday. 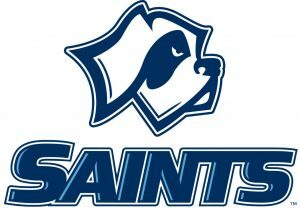 Meanwhile, the Saints softball team rallied for five runs in the bottom of the seventh to pick up a 5-4 win over Lake Sumter State College Sunday afternoon in Gainesville. The Lake Hawks took the nightcap 7-2. The Sunday split follows Saturday’s sweep over Daytona State. SF picked up 11-1 and 3-2 wins Saturday in Gainesville. The Saints (22-24, 10-10 MFC) are battling Florida State College/Jacksonville for third place in the conference with four games remaining in the season. SF will host St. Johns River State College for a doubleheader Thursday with game one scheduled to begin at 2:30 p.m. before winding up the regular season with a doubleheader at Seminole State College Saturday.